Indianapolis based illustrator and graphic designer Manuja Waldia is a rare creative who is known for two very different and distinct styles of illustration. Her whimsical, painterly and playful work takes us on a magical journey of ethereal rituals, festivals and gatherings covering themes of feminism and friendships. In contrast to this is Manuja’s more vector based illustrations, created with detailed precision and geometric perfection, which grabbed the attention of Penguin’s creative Director Paul Buckley, and ultimately won her a once in a lifetime opportunity to illustrate covers for Penguin Classics Shakespeare series. “I work in the two styles, as they are perfect foils of each other. When I get burned out with one, I work in the other, which makes for the most constructive productive change.” says Manuja. Although aesthetically contrasting, there still remains a parallel between her two styles through narrative, composition and the symbolic nature of her work, often leaving the viewer with a curiosity to find a deeper meaning beyond just what meets the eye. Influenced by being brought up in 90’s suburban India with a family that heavily advocates meritocracy, we speak to Manuja about what makes her tick as a creative. Tell us a bit about your background, where are you from and what did you study? I am originally from India, and I studied Fashion Communication at NIFT, New Delhi. I did not see myself fitting in the industry very well, so I decided to shift focus and hone in on graphic design at the Milwaukee Institute of Art & Design. After graduating in 2014, I taught myself how to draw and illustrate. How did you discover that illustration was something you were going to pursue as a career? I think I have two distinct styles as of now. One is the very geometric vector style (example, the Pelican Shakespeare book series) and the other is the analog looking painterly style. The common thread between the two is my love for symbolism — I always hide a lot of Easter eggs and meaningful elements in my illustrations. What sorts of themes define your subject matter? The plot, and art direction by the team defines book covers. My personal work can be over-simplified as scenes from memory, experiences and wishful thinking through the brown girl gaze. I like to draw a lot of girls and feminist themes. How do you begin a piece of illustration, can you explain your creative process? Like I said I draw from my past and present experience. Sometimes they are real, and sometimes made up. I start sketching in pencil, and massage the sketches over and over till I am happy with the basic structure, after which I color it in. Big surprise there! 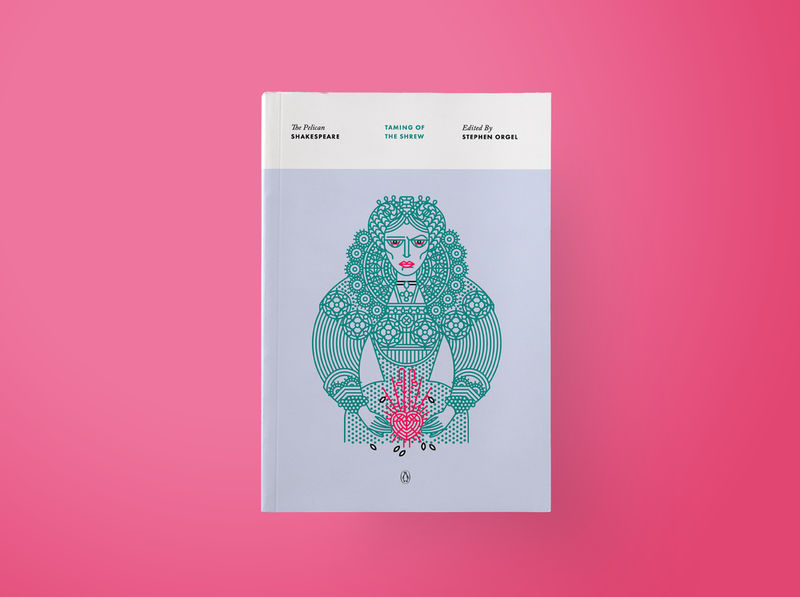 How did the project to illustrate Penguin's Pelican Shakespeare series book covers come about? I wrote to Paul Buckey with a link to my (terribly amateur) student portfolio right after graduating in 2014. He was very kind and took the time to look at it and got back to me with the once in a lifetime opportunity of illustrating the Penguin Classics Shakespeare series. I FREAKED out and screamed and danced with my cat for half an hour, before sobering up and letting reality sink in. Which sunk in HARD, as the previous editions have been done by design giants like Milton Glasser. I cannot be more thankful or thrilled, and try to do my very best with each title. And finally, what was it like to work with Penguin on the covers? How did you arrive at the chosen illustration style? Research – I start by reading and researching the material. It's a combination of reading the text, scholarly analysis, podcasts, watching movie/plays/adaptations, etc. The editorial team provides me with some initial ideas of their own, which are helpful insights as to which directions would work better over others. Thumbnails – I explore those along with a few ideas of my own as wordlists, or quick pencil thumbnails. Thumbnails help me explore compositions/elements for the same idea, quickly. Final Pencil Sketches – From these thumbnails (12-16) I blow out 6-8 enlarged pencil sketches, the art team selects two, one for the front and another for the verso. Digitization – I digitize them on Adobe Illustrator along with drawing out a couple of icons for the spine. Next comes final thoughts from the Penguin team, selecting a spine icon, polishing up artwork, and DONE!